Here’s some good news for AquaIllumination owners and potential on-the fence-customers who are comparing light fixtures across multiple brands feature for feature. After listening to customer feedback, AI recently announced the release of a major revision to their New Controller firmware. This new update offers a bevy of new options, including support for the custom AI PowerPucks, wireless operation for SOL and Nano modules using the wireless adapter, a global regional timer to mimic sunrise/sunset times of major coral reefs, and much more. This firmware update is, of course, free to everyone who owns the New Controller and it is currently available to download from the AquaIllumination website. Getting into the specifics of the update, the biggest features we like are the fail safe Vega dim down and the global region timers that simulate the light schedule of major reefs around the world. The fail safe dim down of the AI Vega is particularly important to prevent coral burning if the modules lose wireless communications. The other feature, which AI calls Global Region Timers, is useful for those aquarists looking to recreate natural conditions as much as possible. 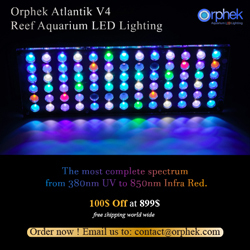 While there are few details to go off of, we assume that these lighting programs will run similarly to Pacific Sun’s PAR Programs, which alter the amount of light being emitted into the aquarium based on a specific region and time of day. Support for PowerPuck™ custom pucks. Adds wireless operation for Sol White, Sol Blue, and Nano when used with Wireless Adapter (sold separately). Supports full sunrise/sunset/cloud sweeps and weather effects for all Sol and Nano models. Supports both Sol and Vega models simultaneously (wireless mode) with one controller. Fail-safe Vega dim down prevents coral burning if wireless communications fail for an extended period of time. Global Region Timers simulates actual sunrise/sunset times of major coral reefs around the world. GPS coordinate Timers for automatic local sunrise/sunset tracking. Fully automatic sweep speed for up to 30 Vega lighting modules. Revamped user interface for easier setup and control. The update also brings with it a show-stopping bug, which spontaneously changes the lights to a dim moonlight mode at random times. Hopefully it doesn’t happen when you’re out of the house and are unable to catch it. Your corals could miss out on an entire day of light. I downgraded back to the old firmware.